Home improvement company owners are increasingly looking at ways to diversify and add a quality service to their portfolio of products and services, which is why Roof Assured by Sarnafil has seen a significant increase in the number of companies wanting to join its approved installer network. Before approval onto the network, installers must participate in the four day Sarnafil Roof Assured Installer Training Programme held at the Roofing Academy at Sika’s head office in Welwyn Garden City. 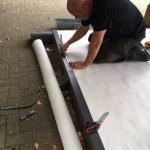 The course is conducted by one of the Sika Roofing Field Technicians and is designed to ensure that the installer understands the requirements when it comes to working with a Sika Roof Assured roofing system. Installers come from a variety of business backgrounds and it’s a great opportunity to offer a premium product that’s well known to Architects and be part of a global company that is an attractive business proposition. Differentiating themselves ‘from the cowboys’, standing out from the competition and pride in delivering a prestigious product and service becomes increasingly important in a cluttered marketplace. Roof Assured operates an approved installer card certification scheme which means that installers have their cards renewed every two years. Field Technicians accompany new installers on their initial projects offering them support and advice and then spot checks are made regularly. Home improvement companies wanting to know more about how to become a Roof Assured by Sarnafil registered installer should visit www.roofassured.co.uk/installer.